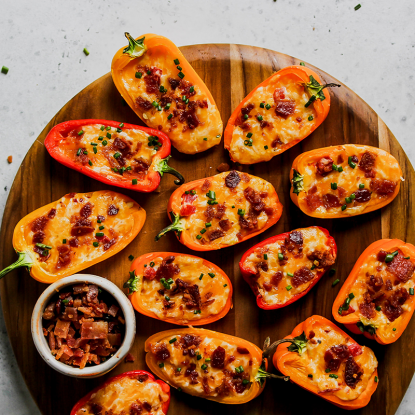 Score big with your fellow football fans by serving these crowd-pleasing snacks, starters and sips for the Big Game. Disclosure: Thank you to ALDI for sponsoring this blog post and for making Big Game entertaining delicious and affordable. Game day watching just got even more delicious with this assortment of tailgating recipes from ALDI. Being huge sports fans, Brent and I love getting together with friends to watch our favorite football games like the College Football National Championship, and…pretty much any and all college football Saturdays in the fall. Whether we’re hosting or watching at a friend’s house, I like to make sure everyone’s stomach stays full and there is plenty of good food to eat. That’s where ALDI comes in, as they take the pressure off game day by having everything on your list in one place – saving you both time and money. That’s why when you shop at ALDI, you don’t just win, you win-win. Because ALDI is my #1 place to shop, I can easily find all of the crowd and wallet-pleasing products I need. In fact, it is a one-stop shop for affordable entertaining because they are always stocked with fun and clever seasonal swag (aka “ALDI Finds”) like football or stadium shaped-silicone cake molds or adorable football-themed tableware as well as fresh, quality ingredients. Thankfully, ALDI has all of my big game needs covered from tasty appetizers and snacks (healthy options too!) to sweet treats to beer and wine. Watch as I share my some of my favorite tailgating appetizers and snacks from ALDI with my friends at Atlanta’s 11Alive as we gear up for the biggest football game of the year. 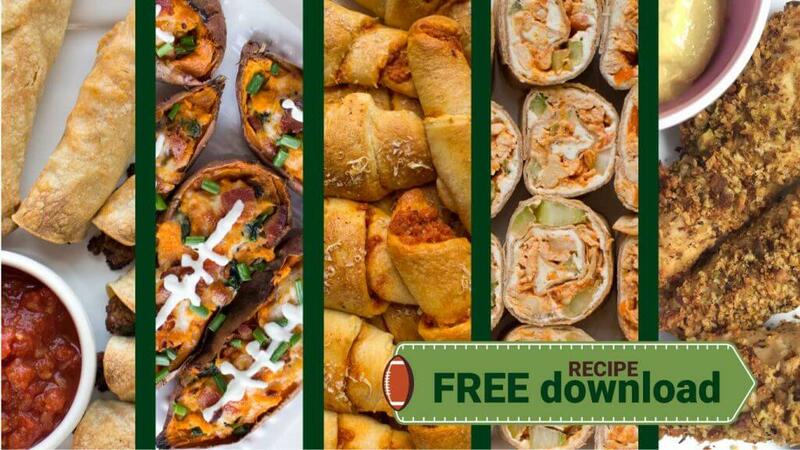 Then, scroll down to find these recipe ideas and more to help you put together your best game day menu. Since friends will be mingling not only in front of the TV but also in the kitchen, on the porch and in our downstairs den, I like to keep small bowls of bite-sized snacks around. Two salty and savory trail mix ideas that I am a fan of making are Bacon Ranch Trail Mix and Honey Mustard Snack Mix. Each of these have their own unique flavors that make them a fan favorite. 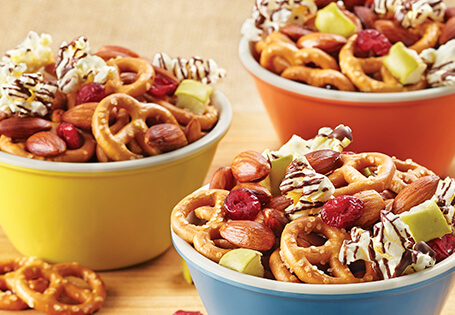 Another fun mix is On-the-Go Party Mix because it combines both sweet and salty flavors with soft and crunchy textures. Fresh green apple, dried cranberries and chocolate bring the sweet flavor while popcorn and pretzels add the crunch. I like to use the award-winning liveGfree pretzels from ALDI when I make this snack so people following a gluten free lifestyle can enjoy. My friend, Lauren, makes the most amazing Buffalo Chicken Dip and it is hands down the party favorite. I love this particular buffalo chicken dip recipe because I can make it in the slow cooker. Translation… throw the ingredients together, turn it on and let it go! Because I like the chicken in my dip to be finely shredded, I use a stand mixer to break it up once it is cooked. You can also use a food process or even purchased canned chicken. 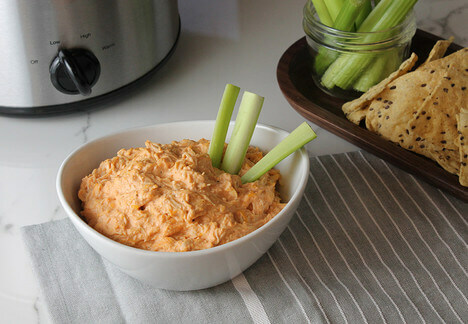 Serve this Buffalo Chicken Dip with celery sticks, cornbread crackers, corn chips or baguette rounds and watch it disappear! Can we talk about shortcuts for a minute? I gave you the shortcut idea above for using canned chicken in the buffalo dip but what about when you’re even shorter on time and need something premade? 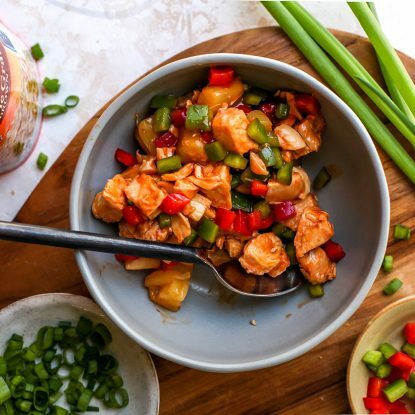 ALDI has your back because they have a wide assortment of premade, prepared items including hummus, salsa and guacamole. I keep containers of their Little Salad Bar Fresh Salsa, Simply Nature Organic Hummus and Park Street Deli Guacamole on-hand at all times. For a fun and fresh tailgating spread, place each of these dips in individual bowls, set those bowls on a large board and surround with freshly cut veggie sticks, assorted chips, crackers, and nuts. Your crowd will love this Chips and Dip Snack Board. The beauty of sliders is that you can offer a variety of flavor options and toppings and because they are small, work them seamlessly into an appetizer menu. 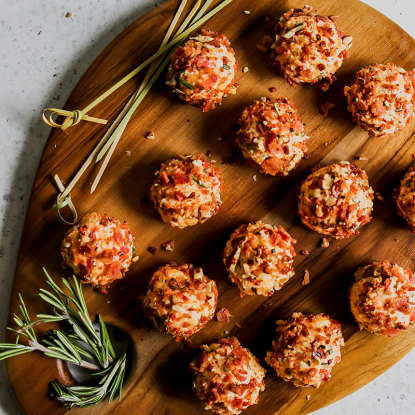 Whether you choose to make beef, pork, chicken or vegetarian, sliders are versatile and always a favorite. Three crowd-pleasing slider recipes that I serve when hosting friends are Game Day Sliders, Pulled Pork Sliders and Grilled Vegetable Sliders. 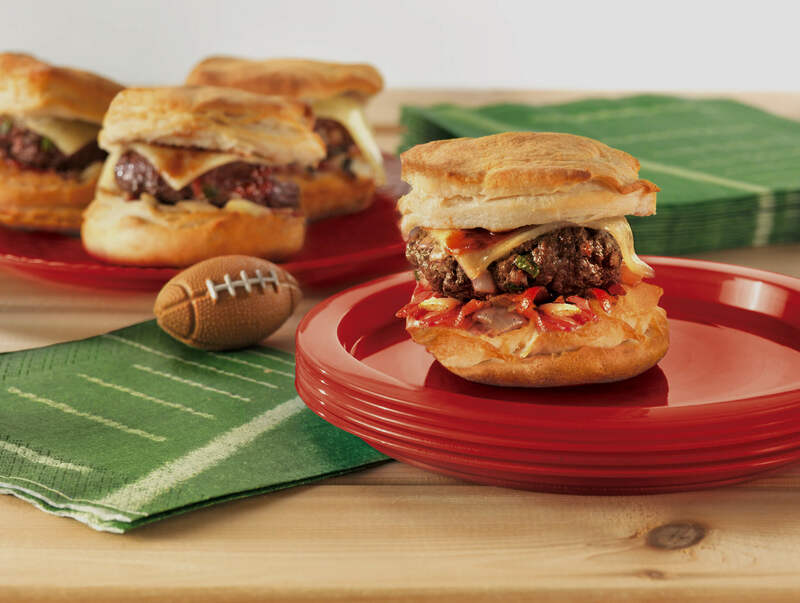 I’m a big fan of how clever the Game Day Sliders are because they use a biscuit for the perfect-sized slider bun. Each of these sliders has chopped jalapeño in the meat mixture for a kick and then is topped with crunchy bacon, creamy Havarti and steak sauce. I guarantee you’ll find your guests coming back for more than one of these! 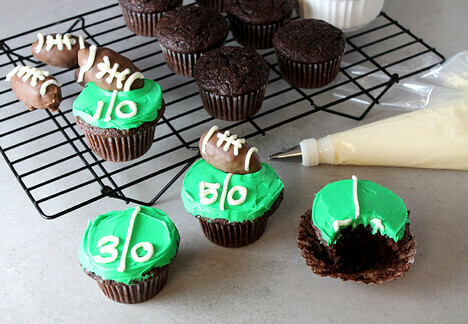 For a 4th quarter favorite, share an assortment of sweet treats like these Game Day Cupcakes. They’re a fun and easy big game treat that starts with a combo of boxed cake mix and boxed brownie mix. Plus, the recipe uses premade vanilla frosting for an additional shortcut. If you are looking for an even easier dessert, grab a container of ALDI Specially Selected gourmet cookies, cheesecake sampler or chocolates. What are you making for the Big Game? Let me know in the comments or share with me on social! For more fun information and tips, “Like” ALDI USA on Facebook and follow @ALDIUSA on Instagram and @ALDIUSA Twitter. And, if you’re like me and want to share your own recipes, photos, tips and tricks, tag ALDI using the hashtag #ALDILove.